The Fine stone is the first stone when you have a smooth, clean edge and you start honing the polishing the set edge. Great stone for finishing Tech skis. 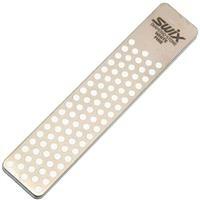 After sliding all day take this file out of your pocket and slide it down your side and bottom edge. This minimal amount of attention to your gear will extend the life of the last tune you had.